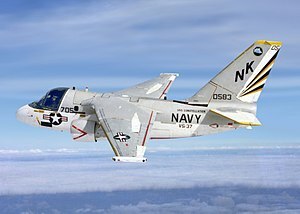 The Lockheed S-3 Viking is a four-seat, twin-engine turbofan-powered jet aircraft that was used by the U.S. Navy primarily for anti-submarine warfare. In the late 1990s, the S-3B's mission focus shifted to surface warfare and aerial refueling. The Viking also provided electronic warfare and surface surveillance capabilities to the carrier battle group. A carrier-based, subsonic, all-weather, multi-mission aircraft with long range; it carried automated weapon systems, and was capable of extended missions with in-flight refueling. Because of the characteristic sound of the Viking's engines, it was nicknamed the "Hoover" after the vacuum cleaner brand. The S-3 was retired from front-line US Navy fleet service aboard aircraft carriers in January 2009, with its missions being assumed by other platforms such as the P-3C Orion, Sikorsky SH-60 Seahawk, and Boeing F/A-18E/F Super Hornet. Several aircraft were flown by Air Test and Evaluation Squadron Thirty (VX-30) at Naval Base Ventura County / NAS Point Mugu, California, for range clearance and surveillance operations on the NAVAIR Point Mugu Range until 2016, and one S-3 is operated by the National Aeronautics and Space Administration (NASA) at the NASA Glenn Research Center. On 4 August 1969, Lockheed's design was selected as the winner of the contest, and eight prototypes, designated YS-3A were ordered. The first prototype was flown on 21 January 1972 by military test pilot John Christiansen, and the S-3 entered service in 1974. During the production run from 1974 to 1978, a total of 186 S-3As were built. 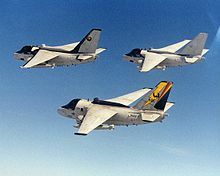 The majority of the surviving S-3As were later upgraded to the S-3B variant, with sixteen aircraft converted into ES-3A Shadow electronic intelligence (ELINT) collection aircraft. The S-3 is a conventional monoplane with a cantilever shoulder wing, swept at an angle of 15°. The two GE TF-34 high-bypass turbofan engines mounted in nacelles under the wings provide excellent fuel efficiency, giving the Viking the required long range and endurance, while maintaining docile engine-out characteristics. The aircraft can seat four crew members, three officers and one enlisted aircrewman, with the pilot and the copilot/tactical coordinator (COTAC) in the front of the cockpit and the tactical coordinator (TACCO) and sensor operator (SENSO) in the back. Entry is via a door / ladder which folds out of the side of the fuselage. When the aircraft's anti-submarine warfare (ASW) role ended in the late 1990s, the enlisted SENSOs were removed from the crew. In the tanking crew configuration, the S-3B typically flew with a pilot and co-pilot/COTAC. The wing is fitted with leading edge and Fowler flaps. Spoilers are fitted to both the upper and the lower surfaces of the wings. All control surfaces are actuated by dual hydraulically boosted irreversible systems. In the event of dual hydraulic failures, an Emergency Flight Control System (EFCS) permits manual control with greatly increased stick forces and reduced control authority. Unlike many tactical jets which required ground service equipment, the S-3 was equipped with an auxiliary power unit (APU) and capable of unassisted starts. The aircraft's original APU could provide only minimal electric power and pressurized air for both aircraft cooling and for the engines' pneumatic starters. A newer, more powerful APU could provide full electrical service to the aircraft. The APU itself was started from a hydraulic accumulator by pulling a mechanical handle in the cockpit. The APU accumulator was fed from the primary hydraulic system, but could also be pumped up manually (with much effort) from the cockpit. All crew members sit on forward-facing, upward-firing Douglas Escapac zero-zero ejection seats. 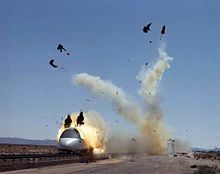 In "group eject" mode, initiating ejection from either front seat ejects the entire crew in sequence, with the back seats ejecting 0.5 seconds before the front in order to provide safe separation. The rear seats are capable of self ejection, and the ejection sequence includes a pyrotechnic charge that stows the rear keyboard trays out of the occupants' way immediately before ejection. Safe ejection requires the seats to be weighted in pairs, and when flying with a single crewman in the back the unoccupied seat is fitted with ballast blocks. At the time it entered the fleet, the S-3 introduced an unprecedented level of systems integration. Previous ASW aircraft like the Lockheed P-3 Orion and S-3's predecessor, the Grumman S-2 Tracker, featured separate instrumentation and controls for each sensor system. Sensor operators often monitored paper traces, using mechanical calipers to make precise measurements and annotating data by writing on the scrolling paper. Beginning with the S-3, all sensor systems were integrated through a single General Purpose Digital Computer (GPDC). Each crew station had its own display, the co-pilot/COTAC, TACCO and SENSO displays were Multi-Purpose Displays (MPD) capable of displaying data from any of a number of systems. This new level of integration allowed the crew to consult with each other by examining the same data at multiple stations simultaneously, to manage workload by assigning responsibility for a given sensor from one station to another, and to easily combine clues from each sensor to classify faint targets. Because of this, the four-man S-3 was considered roughly equivalent in capability to the much larger P-3 with a crew of 12. The aircraft has two underwing hardpoints that can be used to carry fuel tanks, general purpose and cluster bombs, missiles, rockets, and storage pods. It also has four internal bomb bay stations that can be used to carry general purpose bombs, aerial torpedoes, and special stores (B57 and B61 nuclear weapons). Fifty-nine sonobuoy chutes are fitted, as well as a dedicated Search and Rescue (SAR) chute. 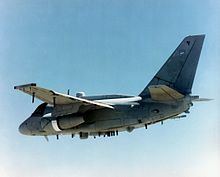 The S-3 is fitted with the ALE-39 countermeasure system and can carry up to 90 rounds of chaff, flares, and expendable jammers (or a combination of all) in three dispensers. A retractable magnetic anomaly detector (MAD) Boom is fitted in the tail. In the late 1990s, the S-3B's role was changed from anti-submarine warfare (ASW) to anti-surface warfare (ASuW). At that time, the MAD Boom was removed, along with several hundred pounds of submarine detection electronics. With no remaining sonobuoy processing capability, most of the sonobuoy chutes were faired over with a blanking plate. Starting in 1987, some S-3As were upgraded to S-3B standard with the addition of a number of new sensors, avionics, and weapons systems, including the capability to launch the AGM-84 Harpoon anti-ship missile. 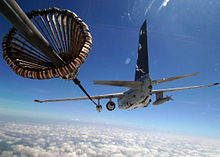 The S-3B could also be fitted with "buddy stores", external fuel tanks that allowed the Viking to refuel other aircraft. 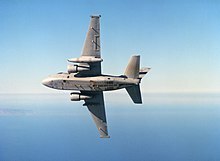 In July 1988, VS-30 became the first fleet squadron to receive the enhanced capability Harpoon/ISAR equipped S-3B, based at NAS Cecil Field in Jacksonville, Florida. 16 S-3As were converted to ES-3A Shadows for carrier-based electronic intelligence (ELINT) duties. Six aircraft, designated US-3A, were converted for a specialized utility and limited cargo COD requirement. Plans were also made to develop the KS-3A carrier-based tanker aircraft, but this program was ultimately cancelled after the conversion of just one early development S-3A. With the collapse of the Soviet Union and the breakup of the Warsaw Pact, the Soviet-Russian submarine threat was perceived as much reduced, and the Vikings had the majority of their antisubmarine warfare equipment removed. The aircraft's mission subsequently changed to sea surface search, sea and ground attack, over-the-horizon targeting, and aircraft refueling. As a result, the S-3B after 1997 was typically crewed by one pilot and one copilot [NFO]; the additional seats in the S-3B could still support additional crew members for certain missions. To reflect these new missions the Viking squadrons were redesignated from "Air Antisubmarine Warfare Squadrons" to "Sea Control Squadrons." The S-3B saw extensive service during the 1991 Gulf War, performing attack, tanker, and ELINT duties, and launching ADM-141 TALD decoys. This was the first time an S-3B was employed overland during an offensive air strike. The first mission occurred when an aircraft from VS-24, from the USS Theodore Roosevelt (CVN-71), attacked an Iraqi Silkworm missile site. The aircraft also participated in the Yugoslav wars in the 1990s and in Operation Enduring Freedom in 2001. The first ES-3A was delivered in 1991, entering service after two years of testing. The Navy established two squadrons of eight ES-3A aircraft each in both the Atlantic and Pacific Fleets to provide detachments of typically two aircraft, ten officers, and 55 enlisted aircrew, maintenance and support personnel (which comprised/supported four complete aircrews) to deploying carrier air wings. The Pacific Fleet squadron, Fleet Air Reconnaissance Squadron FIVE (VQ-5), the "Sea Shadows," was originally based at the former NAS Agana, Guam but later relocated to NAS North Island in San Diego, California, with the Pacific Fleet S-3 Viking squadrons when NAS Agana closed in 1995 as a result of a 1993 Base Realignment and Closure (BRAC) decision. The Atlantic Fleet squadron, the VQ-6 "Black Ravens," were originally based with all Atlantic Fleet S-3 Vikings at the former NAS Cecil Field in Jacksonville, Florida, but later moved to NAS Jacksonville, approximately 10 miles (16 km) to the east, when NAS Cecil Field was closed in 1999 as a result of the same 1993 BRAC decision that closed NAS Agana. The ES-3A operated primarily with carrier battle groups, providing organic 'Indications and Warning' support to the group and joint theater commanders. In addition to their warning and reconnaissance roles, and their extraordinarily stable handling characteristics and range, Shadows were a preferred recovery tanker (aircraft that provide refueling for returning aircraft). They averaged over 100 flight hours per month while deployed. Excessive utilization caused earlier than expected equipment replacement when Naval aviation funds were limited, making them an easy target for budget-driven decision makers. In 1999, both ES-3A squadrons and all 16 aircraft were decommissioned and the ES-3A inventory placed in Aerospace Maintenance and Regeneration Group (AMARG) storage at Davis-Monthan AFB, Arizona. In March 2003, during Operation Iraqi Freedom, an S-3B Viking from Sea Control Squadron 38 (The "Red Griffins") piloted by Richard McGrath Jr. launched from USS Constellation (CV-64). The crew successfully executed a time sensitive strike and fired a laser-guided Maverick missile to neutralize a significant Iraqi naval and leadership target in the port city of Basra, Iraq. This was one of the few times in its operational history that the S-3B Viking had been employed overland on an offensive combat air strike and the first time it launched a laser-guided Maverick missile in combat. On 1 May 2003, US President George W. Bush flew in the co-pilot seat of a VS-35 Viking from NAS North Island, California, to USS Abraham Lincoln off the California coast. There, he delivered his "Mission Accomplished" speech announcing the end of major combat in the 2003 invasion of Iraq. During the flight, the aircraft used the customary presidential callsign of "Navy One". The aircraft that President Bush flew in was retired shortly thereafter and on 15 July 2003 was accepted as an exhibit at the National Museum of Naval Aviation at NAS Pensacola, Florida. Between July and December 2008 the VS-22 Checkmates, the last sea control squadron, operated a detachment of four S-3Bs from the Al Asad Airbase in Al Anbar Province, 180 miles (290 km) west of Baghdad. The planes were fitted with LANTIRN pods and they performed non-traditional intelligence, surveillance, and reconnaissance (NTISR). After more than 350 missions, the Checkmates returned to NAS Jacksonville, Florida, on 15 December 2008, prior to disestablishing on 29 January 2009. VX-30's S-3B, callsign "Bloodhound 700", in 2010. The S-3B N601NA has been operated by NASA since 2009. In June 2010 the first of three aircraft to patrol the Pacific Missile Test Center's range areas off of California was reactivated and delivered. The jet aircraft's higher speed, 10-hour endurance, modern radar, and a LANTIRN targeting pod allowed it to quickly confirm the test range being clear of wayward ships and aircraft before tests commence. 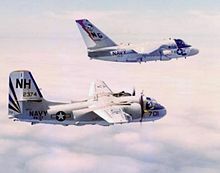 These S-3Bs are flown by Air Test and Evaluation Squadron Thirty (VX-30) based out of NAS Point Mugu, California. Also, the NASA Glenn Research Center acquired four S-3Bs in 2005. Since 2009, one of these aircraft (USN BuNo 160607) has also carried the civil registration N601NA and is used for various tests. By late 2015, the U.S. Navy had three Vikings remaining operational in support roles. One was moved to The Boneyard in November 2015, and the final two were retired, one stored and the other transferred to NASA, on 11 January 2016, officially retiring the S-3 from Navy service. Naval analysts have suggested returning the stored S-3s to service with the U.S. Navy to fill gaps it left in the carrier air wing when it was retired. This is in response to the realization that the Chinese navy is producing new weapons that can threaten carriers beyond the range their aircraft can strike them. Against the DF-21D anti-ship ballistic missile, carrier-based F/A-18 Super Hornets and F-35C Lightning IIs have about half the unrefueled strike range, so bringing the S-3 back to aerial tanking duties would extend their range against it, as well as free up more Super Hornets that were forced to fill the role. Against submarines armed with anti-ship cruise missiles like the Klub and YJ-18, the S-3 would restore area coverage for ASW duties. Bringing the S-3 out of retirement could at least be a stop-gap measure to increase the survivability and capabilities of aircraft carriers until new aircraft can be developed for such purposes. In October 2013, the Republic of Korea Navy expressed an interest in acquiring up to 18 ex-USN S-3s to augment their fleet of 16 Lockheed P-3 Orion aircraft. In August 2015, a military program review group approved a proposal to incorporate 12 mothballed S-3s to perform ASW duties; the Viking plan will be sent to the Defense Acquisition Program Administration for further assessment before final approval by the national defense system committee. Although the planes are old, being in storage kept them serviceable and using them is a cheaper way to fulfill short-range airborne ASW capabilities left after the retirement of the S-2 Tracker than buying newer aircraft. Refurbished S-3s could be returned to use by 2019. In 2017, the Republic of Korea Navy canceled plans to purchase refurbished and upgraded Lockheed S-3 Viking aircraft for maritime patrol and anti-submarine duties, leaving offers by Airbus, Boeing, Lockheed Martin, and Saab on the table. In April 2014, Lockheed Martin announced that they would offer refurbished and remanufactured S-3s, dubbed the C-3, as a replacement for the Northrop Grumman C-2A Greyhound for carrier onboard delivery. The requirement for 35 aircraft would be met from the 91 S-3s currently in storage. In February 2015, the Navy announced that the Bell Boeing V-22 Osprey had been selected to replace the C-2 for the COD mission. First production version, 187 built. Upgraded avionics, AN/APS-137 inverse synthetic aperture radar, Joint Tactical Information Distribution System, AGM-84 Harpoon launch capability, first flight 13 September 1984, 119 converted from S-3As. The ES-3A Shadow was designed as a carrier-based, subsonic, all-weather, long-range, electronic reconnaissance (ELINT) aircraft. 16 aircraft were modified, replacing the EA-3B Skywarrior, and entering fleet service in 1993. The ES-3A carried an extensive suite of electronic sensors and communications gear, replacing the S-3's submarine detection, armament, and maritime surveillance equipment with avionics racks accommodating the ES-3A's sensors. These modifications had minor impact on airspeed, reducing its top rated speed from 450 KTAS to 405 KTAS but had no noticeable impact on the aircraft's range and actually increased its rated loiter time. Because these aircraft were standoff indications and warnings platforms and were never intended to be part of an ingress strike package, this new speed limitation was considered insignificant. Proposed dedicated air tanker with fuel capacity of 4,382 US gal (16,600 l), one converted from YS-3A, later converted to US-3A. Proposed air tanker based on S-3B and utilizing the buddy refueling system, not built. S-3A modified for carrier onboard delivery, capacity for six passengers or 4,680 lb (2,120 kg) of cargo, retired in 1998. Conversion of six aircraft for overland surveillance and Elint missions. May have dropped ground sensors in the Bosnian War. S-3Bs fitted with still-classified modifications. Proposed anti-smuggling variant, not built. One aircraft fitted with AN/APG-76 radar in a modified cargo pod under the wing. Also dubbed SeaSTARS in reference to E-8 Joint STARS. One S-3B fitted with Over-the-horizon Airborne Sensor Information System (OASIS III), returned to regular S-3B in 1998. This particular Viking is now on display at the USS Midway Museum, located on the decommissioned USS Midway (CV-41). One aircraft was transformed into a state-of-the-art NASA research aircraft. The Navy's Fleet Readiness Center – Southeast and a Boeing facility in Florida enhanced the plane by adding commercial satellite communications, global positioning navigation and weather radar systems. They installed research equipment racks in what was once the plane's bomb bay. 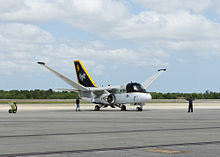 NASA's S-3B Viking is equipped to conduct science and aeronautics missions, such as environmental monitoring, satellite communications testing and aviation safety research. 157993 – NAS Jacksonville Aircraft Heritage Park, NAS Jacksonville, Jacksonville, Florida. 159417 – Celebrity Row, Davis-Monthan AFB (North Side), Tucson, Arizona. 159404 – Celebrity Row, Davis-Monthan AFB (North Side), Tucson, Arizona. 159387 – Navy One National Naval Aviation Museum, NAS Pensacola, Pensacola, Florida. 159412 – NAS North Island, San Diego, California. 159731 – USS Yorktown (CV-10) at the Patriot's Point Naval and Maritime Museum, Charleston, South Carolina. 159743 – Aviation Wing of the Marietta Museum of History, Dobbins ARB (formerly Atlanta NAS), Atlanta, Georgia. 159755 – NAS Pensacola, Pensacola, Florida. 159766 – USS Midway (CV-41) at San Diego, California. 159770 – Patuxent River Naval Air Museum, Lexington Park, Maryland. 160123 - Air Zoo at Kalamazoo, Michigan. 160599 – USS Hornet (CVS-12) at the former NAS Alameda, Alameda, California. 160604 – Pima Air and Space Museum (adjacent to Davis-Monthan AFB), Tucson, Arizona. ^ "S-3B Viking re-enters USN service in test range surveillance role." Janes.com. Retrieved: 13 March 2015. ^ Francillon 1982, pp. 455–456. ^ a b Godfrey 1974, p. 6. ^ a b c d Goebel, Greg. "The Lockheed S-3 Viking." Air Vectors, 1 May 2005. Retrieved: 21 April 2010. ^ Francillon 1982, p. 457. ^ Francillon, René J. (1987). Lockheed Aircraft Since 1913. Naval Institute Press. Page 467. ISBN 9780870218972. ^ Taylor, John W. R.: Jane's All The World's Aircraft, 1977–78. Jane's Yearbooks, London 1977, p. 329. ^ a b Elward 1998, pp. 54–55. ^ Elward 1998, p. 69. ^ Petrescu, Dr. Relly Victoria; Petrescu, Dr. Florian Ion. Lockheed Martin. Norderstedt, Germany: Books on Demand GmbH. p. 101. ISBN 978-1481826884. ^ Taylor 1976, pp. 315–316. ^ Air International July 1986, pp. 44–45. ^ "U.S. Navy retires last Lockheed Martin S-3B Viking from fleet service." Archived 2 June 2009 at the Wayback Machine Lockheed Martin, 30 January 2009. Retrieved: 21 April 2010. ^ "S-3B Viking re-enters USN service in test range surveillance role." IHS Jane's, 3 June 2010. Retrieved: 8 June 2010. ^ "Last S-3B Viking overhauled at FRCSE heads for California-based test squadron." Naval Air Systems Command (United States Navy), 3 June 2011. Retrieved: 23 April 2013. ^ Sung-Ki, Jung "S. Korea envisions light aircraft carrier." Archived 15 March 2015 at Archive.today Defense News, 26 October 2013. Retrieved: 13 March 2015. ^ Perrett, Bradley; Kim, Minseok (16 March 2017). "S. Korea Eyeing P-8, Swordfish As S-3 Upgrade Dropped". Aviation Week. Melbourne, Australia and Seoul. Archived from the original on 19 October 2017. Retrieved 19 October 2017. ^ Waldron, Greg (18 October 2017). "ADEX: Big MPAs hunt for Seoul maritime requirement". FlightGlobal. Seoul. Archived from the original on 19 October 2017. Retrieved 19 October 2017. ^ Cavas, Christopher P. "Lockheed revives an old idea for new carrier cargo plane." Defense News, 9 April 2014. ^ Kreisher, Otto. " Navy 2016 budget funds V-22 COD buy, carrier refuel." Breaking Defense, 2 February 2015. ^ Michell 1994, pp. 334–335. ^ Elward 1998, p. 53. ^ Wittry, Jan."Military Aircraft to Perform Aviation Safety Research." NASA's Glenn Research Center, 2 August 2008. Retrieved: 21 April 2010. ^ "S-3 Viking/157993." aerialvisuals.ca Retrieved: 8 July 2015. ^ "S-3 Viking/159417." aerialvisuals.ca Retrieved: 8 July 2015. ^ "S-3 Viking/159404." aerialvisuals.ca Retrieved: 8 July 2015. ^ "S-3 Viking/159387." National Naval Aviation Museum. Retrieved: 8 July 2015. ^ "S-3 Viking 159412." aerialvisuals.ca Retrieved: 8 July 2015. ^ "S-3 Viking/159731." USS Yorktown Museum. Retrieved: 8 July 2015. ^ "S-3 Viking/159743." Aviation Wing of the Marietta Museum of History. Retrieved: 8 July 2015. ^ "S-3 Viking/159755." aerialvisuals.ca Retrieved: 8 July 2015. ^ "S-3 Viking/159766." Archived 9 July 2015 at the Wayback Machine USS Midway Museum. Retrieved: 8 July 2015. ^ "S-3 Viking/159770." aerialvisuals.ca Retrieved: 8 July 2015. ^ aerialvisuals.ca Retrieved: 8 November 2017. ^ "S-3 Viking/160599." USS Hornet Museum. Retrieved: 8 July 2015. ^ "S-3 Viking/160604." Pima Air and Space Museum. Retrieved: 8 July 2015. Elward, Brad E."Lockheed S-3 Viking and ES-3A Shadow." World Air Power Journal', Volume 34, Autumn–Fall 1998. ISBN 1-86184-019-5, pp. 48–97. Godfrey, David W. H. "Fixer, Finder, Striker: The S-3A Viking." Air International, Volume 7, Issue 1, July 1974, pp. 5–13. Michell, Simon. Jane's Civil and Military Upgrades 1994–95. Coulsdon, UK: Jane's Information Group, 1994. ISBN 0-7106-1208-7. "Viking Variations". Air International, Volume 31, Number 1, July 1986. pp 41–45. Wikimedia Commons has media related to Lockheed S-3 Viking. This page was last edited on 9 April 2019, at 02:12 (UTC).